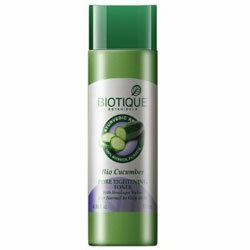 Biotique Toner - Worldwide Shipping. Refreshes, tones and brightens the complexion. This refreshing, pore tightening toner is blended with cucumber, coriander, nutgalls, berberry, peppermint oil and the fresh waters found in the foothills of the Himalayas. It is formulated to bring the complexion into perfect pH balance and help keep skin in its purest state.